Praised by the press as "a magician" (New York's WQXR), whose "virtuoso playing conjures an astonishing range of colour and dynamic" (The Daily Telegraph), Sivan Magen transforms the harp into an expressive, colorful and virtuosic instrument, moving it to center stage through the exploration of the standard repertoire, the commissioning of today's composers and his new adaptations to the harp of some of the greatest music of the last three centuries. The only Israeli to have ever won the International Harp Contest in Israel, Magen is a winner of the Pro Musicis International Award and in 2012 was chosen by a committee headed by Dame Mitsuko Uchida as the winner of the Borletti-Buitoni Trust Award. He appeared as a soloist across the United States, South America, Europe and Israel, in venues such as Carnegie Hall, Wigmore Hall, the Sydney Opera House and the Vienna Konzerthaus, and with orchestras such as the Israel Philharmonic, the Strasbourg Philharmonic, the Scottish Chamber Orchestra, the Jerusalem Symphony, the Sydney Symphony and the Vienna Chamber Orchestra. In fall 2014 he had been invited by Carnegie Hall to return for a recital in celebration of the American release of his first solo CD for Linn records, Fantasien, a recital which also included the world premiere of the Carnegie Hall-commissioned Fantasy for solo harp by American composer Sean Shepherd. Aside from his activity as a soloist, Magen is an avid chamber musician and has appeared in Paris (Salle Gaveau), New York (Allice Tully Hall, the Metropolitan Museum, Bargemusic), with Musicians from Marlboro, and at the Marlboro, Kuhmo, Giverny, and Jerusalem International Chamber Music festivals, collaborating with artists such as Nobuko Imai, Shmuel Ashkenazi, Gary Hoffman, Michel Letiec, Charles Neidich, Carol Wincenc, Emmanuel Pahud, tenor Nicholas Phan, soprano Susanna Phillips and members of the Guarneri and Juilliard Quartets. He is a founding member of trio Tre Voci with flutist Marina Piccinini and violist Kim Kashkashian, with whom he has toured extensively in Europe and the United States, and has released this season to great critical acclaim a new CD for ECM of music by Debussy, Gubaidulina, and Takemitsu. Magen is also a founding member of the Israeli Chamber Project, a group formed in January 2007 that performs in both outreach venues and major concert halls in Israel and the United States, including Enav Center in Tel Aviv, the Embassy Series in Washington, D.C., and Carnegie's Weill Hall, Town Hall, Merkin Hall, Symphony Space, the Morgan Library and Bargemusic in New York City. The ICP is the winner of the 2011 Israeli Ministry of Culture Outstanding Ensemble Award. In past seasons, released to great critical acclaim were a CD with the Israeli Chamber Project for Azica Records as well as the all-Britten CD Still Falls the Rain with tenor Nicholas Phan for Avie (listed in The New York Times' "Best Recordings of 2012"). Later this season will be released his second solo CD for Linn, titled Turn of the Centuries: France. His performance of Ravel's Introduction and Allegro is featured on the Marlboro festival's 60th Anniversary CD. Magen is also gaining a reputation as a sought-after teacher, presenting masterclasses in the United States (The Juilliard School, The Curtis Institute, The Peabody Institute, The New England Conservatory, Duquesne University, University of Texas), Colombia, Taiwan and Israel, the Paris Conservatory, the Utrecht Conservatory, London's Guildhall School and Trinity College, the summer Academy in Nice, the Kuhmo Festival Academy in Finland, and the Jerusalem Music Academy's International "Music in the Valley" seminar for strings. In addition, he has been invited to serve as member of the jury of the International Harp Contest in Israel, the first Netherlands International Harp Competition, the Lyon & Healy Awards and the 2011 Vera Dulova International Harp Competition in Moscow, and served as Head of the Jury of the 2007 National Harp Contest in Taiwan. He is currently a faculty member at the Conservatory of Music of Brooklyn College. Born in Jerusalem, Sivan Magen studied the piano with Benjamin Oren and Talma Cohen and the harp with Irena Kaganovsky-Kessler at the Jerusalem Academy for Music and Dance. 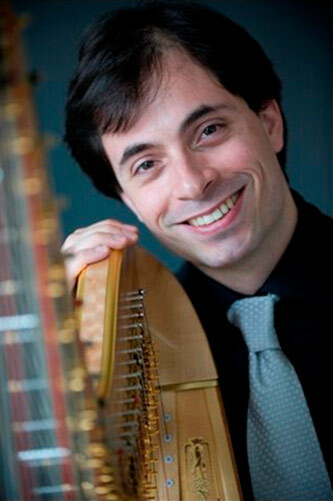 After completing his military service as an "Outstanding Musician" in 2001, he continued his studies with Germaine Lorenzini in France and then joined Isabelle Moretti’s harp class at the Paris Conservatory (CNSMDP) from which he graduated with a "Premier Prix." He then completed a master of music degree as a student of Nancy Allen at the Juilliard School. He currently resides in New York City.